The Alaska Communications System (ACS) was the major link between the forty-eight states and the territory of Alaska for many years. I am not sure just when it ceased operation but it was certainly alive in 1947 when I was a technician at the Campbell Point receiver station near Anchorage. Radio-teletype receiver racks at the Campbell Point receiver station outside of Anchorage, Alaska. This station was the main link to the lower forty-eight states, and handled radio-telephone, teletype, ship-to-shore, and other phone services. This was a U.S. Army Signal Corp outfit called the Alaska Communications System (ACS). Its history began long before World War II. ACS handled the radio teletype, radio telephone, and other services for the public as well as for the military at the time I was there. Headquartered in Seattle, Washington, the main Alaskan office was located in the Federal Building in downtown Anchorage. Calls received at Campbell Point were connected via phone lines to Anchorage where the they were handled and forwarded to their destination either via the phone lines or the ACS transmitters located elsewhere near Anchorage. We monitored a number of frequencies from other areas in Alaska, as well as the 500 kHz ship-to-shore frequency. Some of these were Morse code, some were voice, and some were radio teletype. 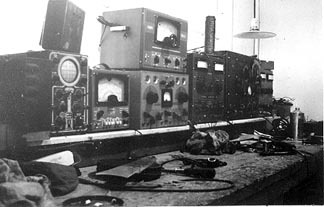 The receiver station, upon hearing a call, connected the radio receiver's output to the lines to the Anchorage office. It was a noisy place to be with all those receivers connected to loudspeakers all the time! Initially it was a real problem for me since I was not familiar with Morse code, but in time I could easily recognize our call letters, WXE. (dah did dah, dah dit dit daw, dit) I can still hear them! The bulk of the receivers we used were Hammarlund Super Pros. There were a few Hallicrafter SX28s but they were not stable enough for TTY work and required constant re-tuning. Super pros would generally stay in tune for several hours. The routine was to check the tuning several times during an eight-hour shift. We had a diesel generator plant for use when the regular electric power failed. This required a run to another building and hand-cranking the diesel engines. The loss of power, followed by the different voltage from our generators, required a lot of re-tuning of all those receivers, believe me. The telephone receiver (for long distance phone calls) was an elaborate piece of equipment which consisted of three large relay racks. This was a single-sideband receiver which used each sideband for separate messages. It was a bear to tune and stayed in tune by an elaborate mechanical setup which actually changed the position of the tuning capacitor. It was a Western Electric piece of equipment and was typical of the telephone office equipment of the time. The radio-teletype receivers were used for the news services and other teletype communications. We always had one hooked up to our teletype printer in order to get the latest news as it came in. At about fifteen characters per second, news came in rather slowly! Teletype signals were not like Morse code; on-and-off transmissions (CW). Rather, they used a sort of FM called carrier shift where the transmitted signal shifted in frequency a small amount. 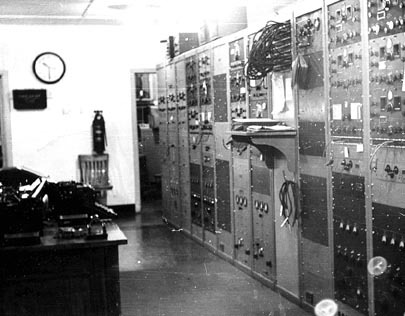 An accompanying piece of equipment converted the shifting frequency into teletype-compatible signals which were then forwarded via the phone lines. These lines were always connected so at least we didn't have to hear that noise added to the cacophony we already had. Most of the people there were not technicians. They were just trained to do the tuning, connecting, listening, and so forth. I was the only experienced radio repairman at that time. Besides the tuning described above, I also did the routine maintenance of the receivers. For the most part this consisted of checking the tubes, electrical connections, etc. During the short time (about six months) is was there, we seldom had a receiver fail but when it did I did the fixing. In typical military fashion we had almost enough spare parts to build another Super Pro! These included tuning capacitors, knobs, and other parts that would never fail unless we were to be bombed! There were a good many antennas around the station. These were of various lengths, types, and directions. 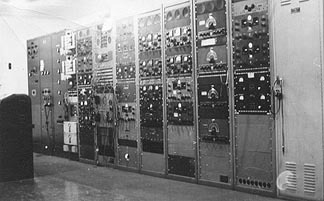 All were brought in to a terminal panel like a telephone switchboard so that any antenna could be connected to any receiver. Since the received frequencies for many of the stations had to be changed during the day, quite often the antenna had to be changed as well. When I first arrived at Campbell Point there were two teletype relay racks waiting to be installed. It seems they had been there for several months waiting for a civilian technician crew to install them. A few months later a team of two men arrived and spent over a week installing one of these terminals. After several weeks waiting for them to return I told the sergeant in charge that if he and another man would put the thing in position (the location in the series of racks that were there) during the day shift, I could wire them in during the graveyard shift when things were relatively quiet. He did this and that night I did the connecting and had it going before my shift was done. It seemed to me that the two technicians were either not skilled or that they were just "making work." The service bench at Campbell Point. Note the expensive equipment and the orderly appearance! The repair bench was in an adjoining room. There we had the usual service equipment, mostly of the type you would find in any civilian radio repair shop. During lull periods I pulled and cleaned some of the receivers. What about the wired telephone lines to Alaska? While these were in place they were not too reliable for a number of reasons. One of the problems was with telephone poles which fell over, breaking the connection. A close friend of mine, now deceased, worked on these lines and said that they were supposed to put the poles into the ground at some depth, say four feet. During the winter there might be six feet of frozen snow on top of the ground so they often just set the pole in the snow, never touching the actual earth. Consequently when the spring thaw came, down came the poles. How true this was, I don't know, but that was his story (among many others!). My experience at the receiver station was a great one. There were just four or five of us there with a master sergeant in charge of the operation. The rest of us were privates; there were more sergeants in the ACS than there were privates, so far as I could see. We were paid by check and purchased our own food, which we cooked ourselves, taking turns as cooks. I'm certain that some of the poorest meals were those that I prepared! World War Two was, of course, over before 1947. They finally decided to discontinue the draft and to discharge all draftees, of which I was one. I left Anchorage in the spring of 1947 and returned to civilian life, going back into the radio repair business. I'll never forget my stay at Campbell Point. It might have been the best job I ever had!